Are You Making the Most Common Marketing Mistake? The irrepressible Michelle Joyce is my agent. She handles all of my events and speaking opportunities over on the JayBaer.com site. On her blog, she runs a Friday series where she interviews speakers that she represents. She interviewed me recently, and I thought I’d post it here as well, as the topics are relevant for Convince & Convert readers. 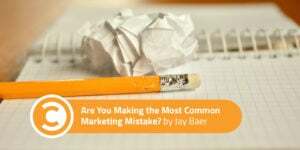 What’s the most common marketing mistake companies make? Every marketer in the history of the world tells themselves the same lie, and when doing so, makes the same mistake. The lie they tell themselves is, “My customers are just too busy.” They believe customers are too busy to read the blog, watch the video, sit through the demo, or interact with the Instagram post. This is completely untrue. It’s not about busy. Are people busier now, or when there was no microwave, ATM, or Uber? We are less busy than ever. What’s changed is that there is more competition for attention. So when a customer says they are “too busy” to interact with the company, that’s a euphemism. What they really mean, but rarely say, is that what you have put in front of them is simply not RELEVANT enough. If you give a customer or prospect the information she needs, in the format she prefers, at the moment when it’s convenient, the time needed to consume and interact with that information will magically appear. Relevancy is the killer app, and relevant marketing creates attention. When a customer complaint is received, what is the best way to address it? Answering a complaint (not necessarily solving the problem, just answering) increases customer advocacy by as much as 50 percent. Not answering a complaint decreases customer advocacy by as much as 25 percent. This is why I recommend answering every complaint, in every channel, every time. What are the critical steps to providing an exceptional customer experience? Customer experience is how we make our customers feel. Done well, customer experience creates new customers for free, as remarkable customer experiences (I call these Talk Triggers) compel word of mouth. The best ways to create Talk Triggers are to observe how customers really use your products and services, and then find ways to consistently deliver something that’s differentiated. For example, there are many car rental services, yet only one has a Talk Trigger: Enterprise, because they’ll pick you up. How can a company benefit from your presentations? I help companies clone their customers. I combine 24 years of experience, advising 700 brands and nearly 40 FORTUNE 500 firms, with day-to-day knowledge of the real-time changes in customer expectations and technology. I identify the marketing, customer service, and customer experience shifts that create winners and losers within industries; translate those shifts to actions; and then give the success recipe away, one audience at a time. I do this with hyper-relevant examples, a big dose of humor, a hopeful message, and a crazy plaid suit. It’s why meeting planners call me the world’s most inspirational marketing and customer service keynote speaker. Why is it so important for organizations to align their sales and marketing teams? Results, plain and simple. Aligned sales and marketing teams (Smarketing, ftw!) increase revenue at rates that far exceed companies that are not aligned. If you just showed up on this planet from another galaxy, or you just finished a 40-year stint in prison, and someone told you that the way most companies run is that one division focuses on marketing, and a whole separate group focuses on sales, you would think that structure to be ridiculous. Yet, it’s the norm. It doesn’t work, and it’s one of my missions to bring the sledgehammer that breaks down the walls between the two groups.